The government in Japan says suicides and depression cost its economy almost 2.7tn yen ($32bn; £21bn) last year. The figures refer to lost incomes and the cost of treatment. It is the first time Japan has released such figures. Japan has one of the world's highest suicide rates, with more than 32,000 people killing themselves last year. 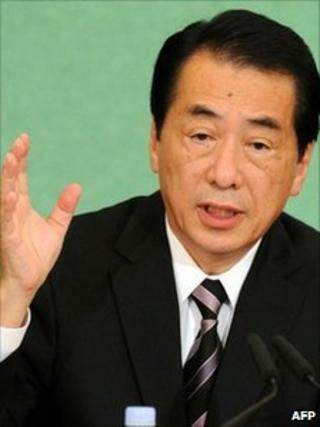 PM Naoto Kan sees it as proof of an economic and emotional downturn. The government is setting up a task force to try to reduce the rate. From Friday, it will run a video clip of a footballer from the J-league on its website, urging people to be more aware of the problem. "Given that the number of suicides in Japan has been over 30,000 for 12 straight years, this is a problem that needs to be addressed by the entire nation," a health, labour and welfare ministry official said. "We hope this study triggers stronger prevention measures." The study showed that those who took their lives last year - 26,500 people in 2009 - when they were aged 15 to 69 would have earned 1.9tn yen had they worked until retirement. Mr Kan has pointed to the suicide numbers as proof of what he believes is wrong with the country, with too many people suffering economically and emotionally. "There are many causes of suicides. Decreasing them would be one way to build a society with a minimum level of unhappiness," he said. But attitudes to depression in Japan arguably demand equally urgent scrutiny, correspondents say. In a country in which stoicism and consensus are highly valued, many older people in particular view mental illness as a stigma that can be overcome simply by trying harder, they say. The use of psychotherapy to treat depression has lagged behind North America and Europe, with Japanese doctors often viewing medication as the sole answer, they add.